Now that warmer weather is finally in sight, it’s time to start thinking about AC maintenance. One of the first and most obvious signs that a compressor may be having trouble is the AC blowing hot air. A damaged or failing compressor will not be able to properly regulate the refrigerant flow and, as a result, the AC system will not be able to cool the cabin. Another potential symptom of a failing AC compressor is loud or unusual noises. Much like other accessories driven by the engine’s belts, the AC compressor has several interior components and uses a sealed bearing to turn. If any of those interior components break or the compressor’s internal bearings fail, then all sorts of noises can be produced. A worn bearing will produce a high pitched squealing or grinding sound, while a seized bearing will produce a grinding noise or a noticeable belt squeal. Due to the complexity and nature of how compressors are assembled, it is usually easiest to replace the entire compressor instead of attempting a repair. Another sign of a problematic compressor is if the clutch is not moving. The clutch on the compressor allows the system to engage and disengage from engine power so that the compressor is only turning when it needs to be. If the clutch seizes it will keep the compressor permanently activated; if it breaks, the compressor will not be able to receive engine power. 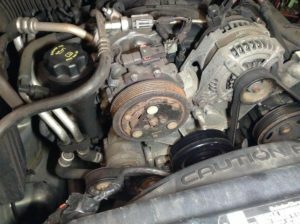 Sometimes the clutch itself can be replaced, but usually replacing the entire compressor turns out to be the most efficient repair. The AC compressor is the heart of the air conditioning system. If you suspect that your AC compressor or another component of your vehicle’s AC system is having issues, have the system diagnosed by one of our professional technicians. All of our auto repair services are backed by an industry-leading 3 year / 36,000-mile warranty on parts and labor. Call us at (413) 314-2280 or schedule an appointment online.